The ankle joint contains three bones called the tibia, fibula and talus that are surrounded by cartilage, or connective tissue, which cushions the bones during everyday movements. Ankle arthritis is characterized by damage or deterioration of the cartilage surrounding any or all of these bones, which results in joint inflammation, pain and swelling. Since the ankle joint moves every time you take a step, the condition can make walking very difficult. 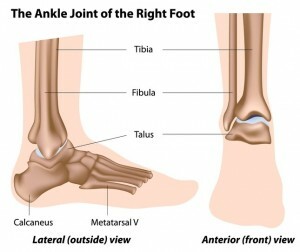 Ankle arthritis is caused when the cartilage that surrounds the bones in the ankle joint is worn down. As a result, the bones in the joint begin rubbing together, causing inflammation and pain. This deterioration of cartilage may occur due to normal wear and tear over time, caused by a specific injury, or the result of an inflammatory disease such as rheumatoid arthritis. What are the types of ankle arthritis? Osteoarthritis is the most common form of arthritis and is characterized by the progressive deterioration and eventual loss of cartilage in one or more places in the ankle joint. Osteoarthritis is also very typical in the big toe joint. Post-traumatic arthritis is characterized by damage to the ankle’s cartilage that develops following an injury, such as a fracture or severe sprain. Rheumatoid arthritis is a chronic inflammatory disorder characterized by the deterioration of cartilage in the ankle joint due to the immune system attacking the tissues. This type of arthritis can also affect the joints in the hands. What are the risk factors for ankle arthritis? If you are experiencing stiffness or pain in the ankle joint, call our office at 212‑434‑4920 or fill out the schedule appointment form on this page so Stuart Katchis, M.D. can evaluate and diagnose your condition. Ankle arthritis is a progressive condition that gets worse over time and treatment outcomes are significantly improved if medical evaluation is sought when symptoms first start. In many cases, symptoms of ankle arthritis can be successfully managed long-term with nonsurgical methods. The first and most important step to improving symptoms is stopping or reducing all activities that make the pain worse. Applying ice to the affected area will help reduce pain and inflammation. Inserts placed in the shoes can help relieve pain and swelling by repositioning the foot and reducing pressure on the inflamed joints as well as providing extra cushioning. Shedding extra pounds can reduce the pressure exerted on the ankle joint and improve symptoms. A brace can provide extra support and stabilization for the affected ankle. Surgery may be required if nonsurgical treatments will not prove effective for relieving pain, particularly in cases of more severe ankle arthritis. The type of surgical procedure recommended by Dr. Katchis will depend upon each patient’s unique situation. A procedure that is often used in the early stages of ankle arthritis, the surgery involves Dr. Katchis using an arthroscope to view the affected ankle. With this technology, he can remove damaged cartilage, scar tissue and any bone spurs that may be present in the ankle joint. This procedure helps decrease many early stage symptoms of ankle arthritis. A procedure utilized when the condition is severe, the surgery involves Dr. Katchis fusing together one or more bones of the ankle joint and removing the damaged cartilage around them. Special devices may be inserted to keep the bones in place while they heal together. After healing the ankle will be permanently fixed, but pain is completely eliminated. A procedure utilized when the condition is severe and only if a patient is a good candidate, this surgery involves Dr. Katchis replacing the worn out ankle with an artificial one. Ankle joint replacement surgery will preserve the up and down movement of the ankle, unlike arthrodesis, and overall it will relieve the pain of arthritis and improve a patient’s ability to walk after a full recovery. Surgical treatment for ankle arthritis involves several weeks or months of recovery depending on the type of surgery performed. With any type of surgery for this condition, it may require you to wear a firm and flat postoperative shoe to protect your foot and ankle while the bones heal. Whether you undergo nonsurgical or surgical treatment for ankle arthritis, Stuart Katchis, M.D. will provide recommendations for long-term measures designed to keep your symptoms from flaring up, such as taking anti-inflammatory medications, wearing orthotics or receiving cortisone injections periodically.